“What on earth does that mean darling?” Assuming, or at least hoping, this didn’t mean me. Well that’s me told I suppose. Last night she didn’t have stories, she wanted to do maths homework, after she’d told me all about her new book, which is more interesting that the story about Aliens she had last week. This one is called Under Sea Horses and is great because it’s “got lots of facts about sea horses and it’s really interesting”. Jolly good. Whatever happened to the Famous Five? Tilly meanwhile got to bring home ‘Beethoven’ last weekend. The class bear. 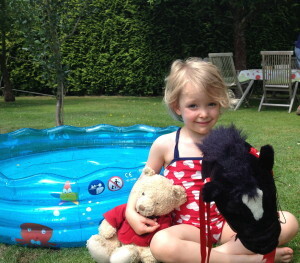 He accompanied her on all the weekend outings, the butchers, the swimming pool, Grandpa’s. It was a great honour and she took it extremely seriously. In her own unique way. Beethoven was constantly having his coat put on and taken off, the weather was causing lots of trouble because he had so much fur. She was very concerned. And I’m not an evil mother, but I do read newspapers.